Here are some photos I took of my new aquarium as I was setting it up. There are not any fish in it quite yet. I also need to add more plants. But it is a beginning. Setting up the substrate and the rock stack for the cichlids. Another shot of the rock stack. Shot with all the rocks together. Close up of the rock stack. These pictures show the entire aquarium. As I have 3 large dogs, I decided to fence off my space so that it will be a protected preserve that will harbor contemplation and quiet. This area will be in the back of my yard beneath and around a willow tree. The tree anchors the space and will allow it to breath. I will take pictures in the next few days to show the beginnings of my space. Well, I have decided to start blogging again. I apologize to my followers for being so absent, but life has been difficult in the last few months. Recent events have included health issues (which I am working on), regular yoga (which is slowly changing my life and I love, love, love!) and currently not working. So I am staying home with the dogs, working in the garden when I have the energy and trying to figure out what I want to do with the rest of my life. Here are some recent pictures from the garden of the poppies in bud. I love how the hairs on the buds are so distinctive. They look like some type of alien plant/lifeform. I also took some pictures of my bleeding heart. To get a close up, I had to use my flash and the macro setting on my lens, hence the almost black background. Dog Breed Quiz--How well will you do? These two images are from our honeysuckle vine right outside our kitchen door. With temperatures in the teens and twenties the last few days, we have an Icicle Waterfall--Amazing isn't it? Aspen going in for the kill! but he is as fast as the wind! "Steampunk is a sub-genre of science fiction, alternate history, and speculative fiction... Specifically, steampunk involves an era or world where steam power is still widely used—usually the 19th century and often Victorian era Britain—that incorporates prominent elements of either science fiction or fantasy"
So with that definition in mind, I want to share with you my thoughts on Book 1 of The Vampire Empire: The Greyfriar. Written by a husband and wife team, Clay and Susan Griffith, this alternative history of a Victorian world not only has vampires, but evil vampires. So many of the vampire books that have been published in the last 10 years or so show a kinder, gentler vampire--vampires that readers see as friends, lovers and companions. Not only are the vampires enthralling and gorgeous, but benevolent in spite of their diet of (mostly) human blood. Vampires that in a sense strive to be as human as possible. Not in the Vampire Empire. Vampires in this novel have taken over the Northern Hemisphere and have bred humans to satisfy their diet of human blood. These factory farmed humans have basically lost the will and desire to fight against their masters. But all is not lost--free humanity has retreated to the Southern Hemisphere where the vampires can't maneuver in the heat and humidity. Enter Princess Adele, heir to the Empire Equatoria, a vestige of the tropical British Empire. Adele is on a tour of the northern frontier (Marseilles, France) when her convoy is attacked and she is kidnapped by a vampire clan. We then are introduced to a mysterious, valiant figure: the Greyfriar. Mythic in stories, this famous but reclusive vampire-hunter shows up to liberate the Princess. As Adele and the Greyfriar attempt to escape the vampire clans, Adele is intrigued by this legendary figure who she thought was a fairy tale. Although a vampire clan manages to re-capture Adele, she knows that the Greyfriar will come for her. Untold horrors await Princess Adele when she is taken deep into vampire territory: bloody orgies and the blank stares of the human slave population. Can Adele survive her kidnapping until the Greyfriar comes for her? The politics of both vampire and human empires are in flux, as forces strive to change the balance of power. Stay tuned for book 2 which will be published November 2011. Amazing historical fiction with details incorporating all your senses. Romance, mystery, murder, and deep abiding friendships are all there. Characters that are so well developed you feel as if you are in the room with them. I would give this book 10 stars if I could. I have loved Jennifer's writing since The Northern Light-- which was the Winner of the Carnegie Medal, the L.A. Times Book Prize, the Borders Original Voices Prize, and a Michael L. Printz Honor award. If you have not read Jennifer Donnelly before you must open one of her books! 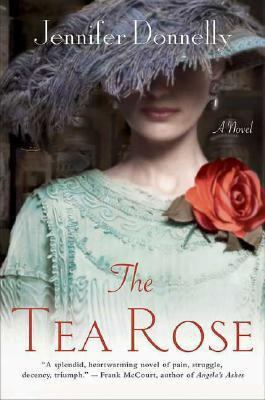 The Tea Rose has a sequel--The Winter Rose which I am impatiently waiting for a copy to be returned to the library so I can get my hands on it. Evidently Jennifer also just finished a third novel in this series that does not have a publication date yet--The Wild Rose. Revolution also just came out with 2 starred reviews from Kirkus and SLJ. Can't wait for this one also! PKCLC October 2, 2010 Lure Coursing--Best in Field! Recently Isabella and Pharaoh debuted in the sport of lure coursing for sighthounds. It was an AKC trial held by the Pocatello Kennel Club in Blackfoot Idaho. Both Pharaoh and Isabella passed their Qualifying Coursing trial enabling them both to enter in the actual trial itself. As the only Irish Wolfhound and the only Afghan Hound competing in this day's event, they both won Best of Breed with scores of 40/50 points (first run) and 40/50 points (second run) for Isabella and 40/50 (first run) and 41/50 points (second run) for Pharaoh! Since this was Isabella's first event and she had run 3 times already I decided to pull her from the Best in Field run. Pharaoh still appeared to have plenty of running left, so along with 3 other dogs, I decided to enter him in Best in Field. He ran against a Scottish Deerhound in his run. What an amazing day for us! Both Pharaoh and Isabella had a great time and we took home lots of ribbons, toys for the dogs and a huge bed that we barely managed to fit in the car. Just a few late night pictures. Isabella has such a great face! Isabella and I entered the RMIWA Specialty 2010 held at Lyons Park in Cheyenne, WY. It was our first specialty and seeing over 100 Irish Wolfhounds in one place was breathtaking. I met so many welcoming and lovely people who shared tips about grooming, stacking and showing in the conformation ring, even though we did not place, it was a wonderful experience. Randy was a real trooper and took pictures, set up and took down all the equipment you need for showing, and drove most of the time. We spent twelve and a half hours at the show site and it was a very long day. We stayed for the dinner and it was great to hear the judges comments. We did well, but I learned that I need to practice striding out to allow Isabella to show off her lovely movement. So both judges did not see her at her best. Here are a series of pictures from the show. IT'S THE MOST WONDERFUL EVENT OF THE YEAR!